Why Are Democrats and Progressives Pushing the U.S. War Machine in Vermont? This is a story primarily about corrupt practices by the Burlington City Council, in its headlong determination to force a neighboring city to be the base for a weapon of mass destruction, the nuclear capable F-35 fighter-bomber (in development since 1992, first flown in 2000, still not reliably deployable in 2018, at a cost of $400 billion and counting). 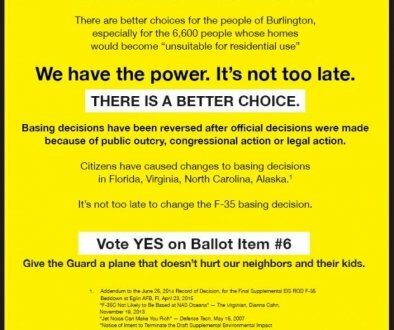 Yes, the premise itself is corrupt: Burlington owns the airport in South Burlington, so South Burlington has no effective say in how many housing units Burlington destroys in South Burlington to meet environmental standards for imposing the quiet-shattering F-35 jet on a community that doesn’t want it and won’t benefit from it. The entire “leadership” of the state of Vermont, mostly Democrats, has spent more than a decade making this atrocity happen, with widespread media complicity.